Born in 1950 as the Broadcaster, a name that would be shot down in legal disputes, the Telecaster, as it is now universally known, has always been a little bit country and a little bit rock and roll. Leo Fender was always a tinkering man, and his interest in equipment used to amplify music led him into the guitar building business. Leo didn't even play guitars, and yet he created the world's first successful solid-body electric guitar. Mr. Fender knew lots of persons were like him, and so his guitar's were built to be mass produced in a manner similar to the Ford Model T, and he also knew they'd sometimes get tinkered with. He produced guitars which were easily customized by persons inclined to do such things. 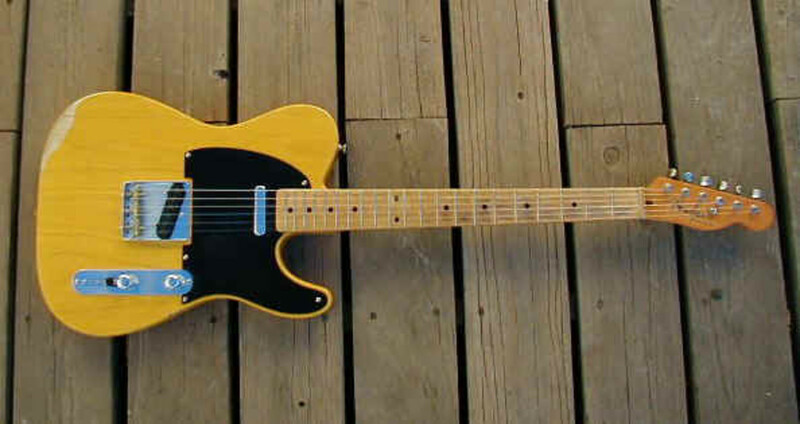 As the years have gone on, there have been large numbers of variations on the original Telecaster theme. This article concerns two of the more noteworthy and expensive ones. 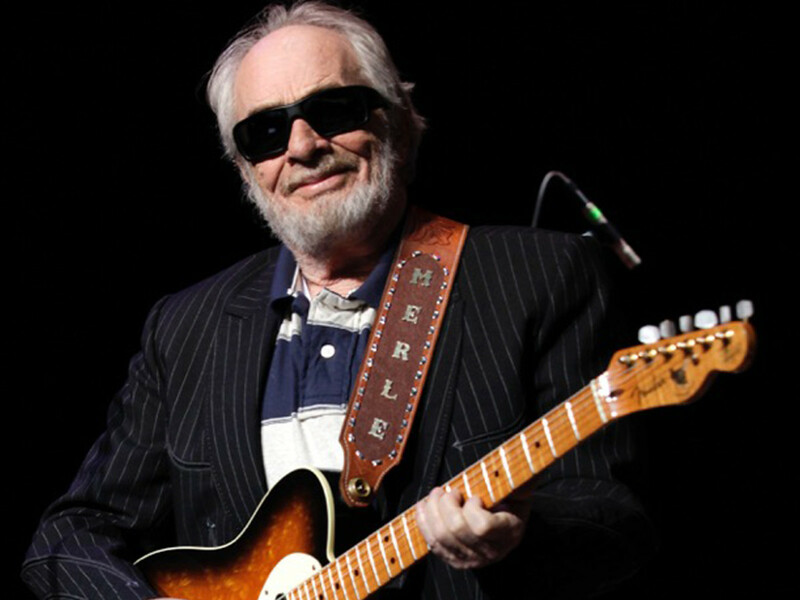 Eight years after the Telecaster was born in California, Merle Haggard was arrested and sentenced to prison there, and this changed the course of his life, and probably for the betterment of us all. Two years after Haggard's arrest, some young men in Liverpool, England would get together and start making music which would change the entire shape of popular music for a long time to come. 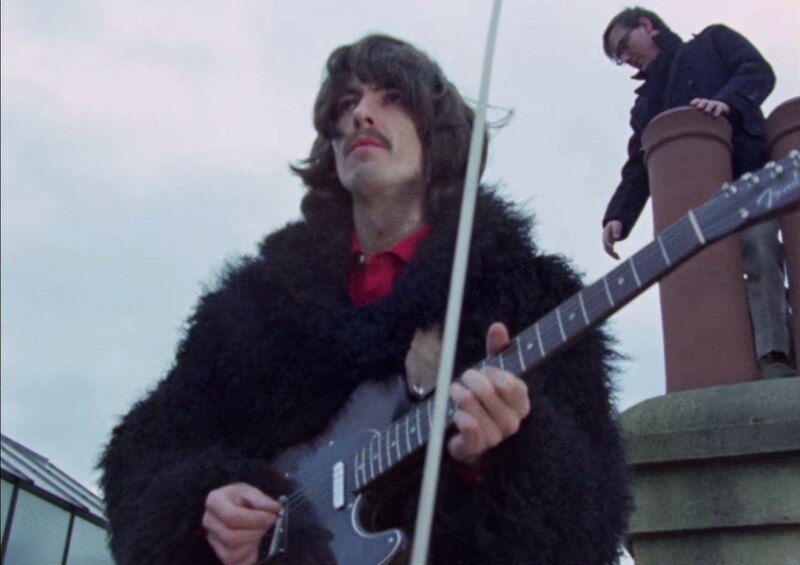 George Harrison with his rosewood Fender Telecaster on a rooftop for Let It Be. When you are only a guy who can play the guitar a bit, it is intimidating to write about someone like George Harrison. I may have been born in 1974, but the music of The Beatles was a huge part of my childhood too. In my family there was always music playing somewhere in the house. I grew up listening to The Beatles the same as persons lots of years older than me did. I hope younger generations also get to appreciate the amazingly diverse and creative music they made. They'd not have done it without George Harrison. 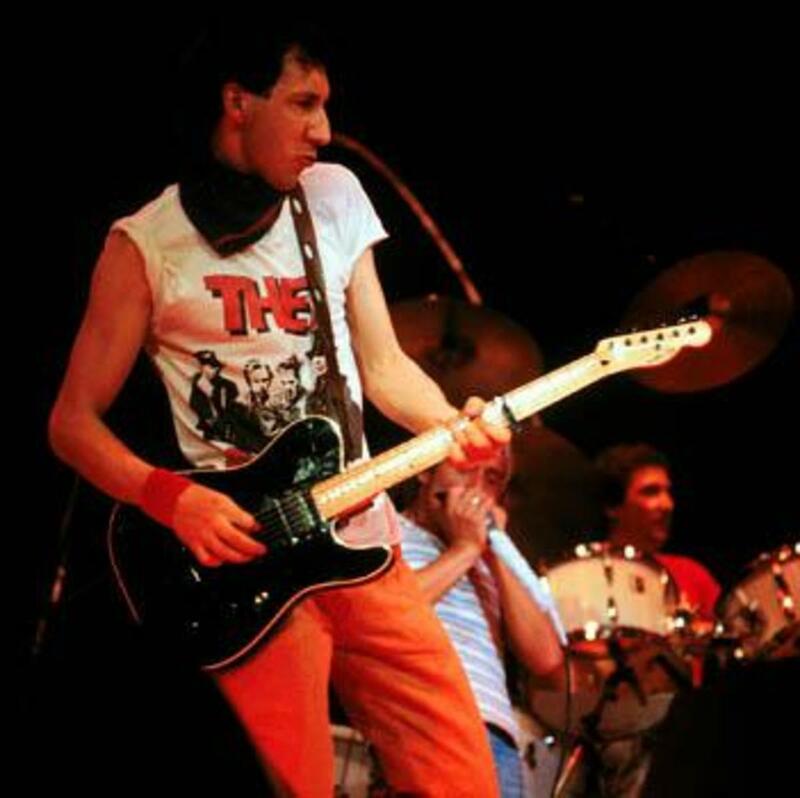 In those early years the notion of guitar heroes simply did not exist. A guitarist wasn't employed to show off, and be the center of attention. A guitarist in those days was expected to do one thing, and one thing only - serve the song being played or recorded. George was, of course, known as 'the quiet Beatle,' for his unassuming demeanor. George Harrison was an accomplished and very versatile guitarist, and his ability to jump from country and western styles, to blues-rock, rockabilly, jazz, and even Indian music was a major contributing factor in the massive success and appeal of The Beatles. He liberally used the Diatonic scale, the Dorian mode, and chords and chord progressions one would associate more with jazz than rock. He seemingly always knew just what to play, and maybe more importantly, what not to. More than just a guitarist in a band where there were two more of them, George wrote and sang some of the most enduring and endearing of The Beatles' songs. He was also more than just a member of the Fab Four, as he had a long and successful solo career, and then engaged in some other fine projects, such as the Traveling Wilburys. From prison inmate to star country and western musician, the tale of Merle Haggard is one I think most of us find inspiring. There is a lot of hope for a lot of people in his life story. While he did manage to become wealthy, he never let success change who he was - a simple man with traditional values. Merle Haggard was one of the early practitioners of something called The Bakersfield Sound. This was a country music movement which rejected slick Nashville production in favor of twangy Fender Telecasters, steel guitars, and rough edges. His lyrics always represented the working person, and the sorts of troubles and worries the heart of America had to deal with. The Bakersfield Sound wasn't the only movement Haggard would be a part of. In the 1970s he'd help spur a revival of Western Swing music, and though he was not a Texan, he'd play a part in what became known as Outlaw Country music, along with persons such as Willie Nelson and Waylon Jennings. Haggard probably didn't think of his music making as something which would turn political, he wound up writing songs which had strong political messages in them just the same. In a time when many youths in the nation were tuning in, turning on, and dropping completely out of social norms, Haggard was singing songs which represented an ethos completely the opposite of such. The Hag, as he was affectionately called, had 38 number one hits on US country music radio and Billboard chart rankings. The list of awards and honors he received is very long. He's in the Country Music Hall of Fame, the Oklahoma Music Hall of Fame, the Nashville Songwriter's Hall of Fame, and that's just a taste of it all. With nearly seventy albums, Merle Haggard recorded at least six hundred songs. He wrote at least two hundred and fifty of those. His award from The Kennedy Center was for being an outstanding contributor to American culture. He most certainly was that. When you are the primary guitarist in the world's most popular band, people pay quite a lot of attention to what instruments you use. George Harrison was in a position to set trends, and over the course of the life of The Beatles, he did just that many different times. From Rickenbacker to the Epiphone Casino, the Gibson SG, and the famous rosewood Telecaster, George was the primary mover in making specific instruments famous. The original guitar George played was custom built for him by a man named Roger Rossmeisel. Roger had grown up learning luthiery, and with his father, had built the first electric guitar in all of Germany. He went on to design guitars for Rickenbacker, and later, Fender. This limited edition recreation is not a one of, but there are only one thousand instruments created. Large metropolitan areas with guitar stores may have them, and in Dallas was where I saw the only one I have, but don't expect these to be consistently easy guitars to find. Of course Fender is a business, and businesses do well to please customers, there could be more of these made. Rosewood is one of the very common woods used in guitar building, but it is almost never used for the body of an electric guitar. The reason for this is rosewood is an extremely heavy wood. Even with acoustic guitars, a very noticeable increase in weight is evident between guitars of the same size, between rosewood and mahogany, or other woods. This guitar would be ridiculously heavy to have strapped across your shoulders except that it is one of the rare Fender guitars to have chambers in the build. What am I talking about? There are empty chambers in the body which are there for weight relief. These chambers do change the sound of the guitar because they increase the vibrations of the rosewood top, providing resonance. I felt like the weight was do-able for performances, but this guitar is heavier than usual. Even the neck of this guitar is of rosewood, and you simply won't see that very often on other guitars. The fingerboard, oh yes, that's rosewood too, and this fingerboard is of a more modern 9.5" radius. It is a rounder fingerboard radius than one accustomed to Gibson or super Strat style guitars would be used to, but it is quite comfortable. All this dense rosewood causes this guitar to produce very noticeably brighter sounds than a typical Tele or Strat will produce. Persons who want a Tele which looks and sounds atypical while also being historically notable should be drawn to this guitar. A fine guitar is a work of art crafted from woods, wires, inspiration, sweat, and love. It is a work of art that one purchases to make further art work with of a different kind. I think most guitars are beautiful, but some took a lot more work and involve finer materials to build than others. By this point you should be catching on that this Merle Haggard guitar is going to be pretty damned expensive. You were never anyone's fool. Lets cut straight to the neck, for here is a neck like no other on any Fender I can think of. What's the deal? Look at the photos above. This guitar doesn't have a bolt on neck, and in fact, it doesn't have any neck joint to speak of. A neck through design is what you are looking at. The center piece of the guitar's body is the same piece of wood as the neck. The wood on either side of the center-piece and neck are what we refer to as wings. These wings are of alder wood, and they are chambered. Because the guitar has a fine maple top, the chambers beneath the maple resonate when the guitar is being played, and the top vibrates like the top of an acoustic guitar. What are the reasons for, and advantages of this neck-through guitar design? Well, without that big block of wood and screws that comprise a bolt on neck joint, the player has more ease of access towards getting his or her fingers on the frets at the upper register. In addition to that most everyone agrees the neck being a part of the center of the guitar gives the guitar a lot more sustain than even set neck construction guitars provide. For every upside there is, of course, a downside. 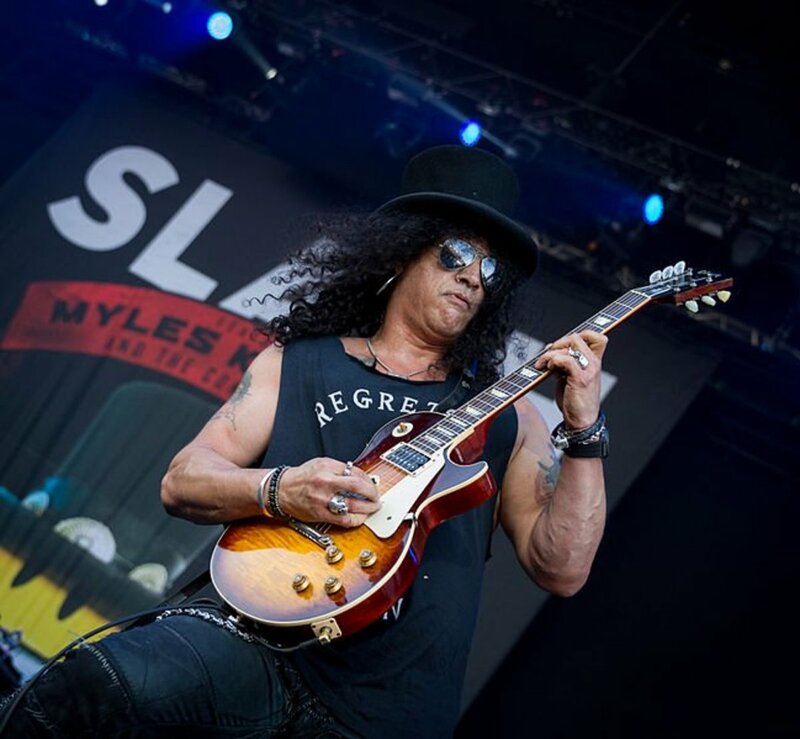 It is hard to mess up the neck on a neck-through guitar, but it isn't impossible, and accidents can happen to even the most careful of persons. It costs lots of dollars and takes lots of labor to repair a damaged neck on this kind of guitar. These days gold color metal hardware on nice guitars is common. This is not a nice guitar, this is a fine guitar, and the gold metal hardware here is not just color, it's gold plate. Merle Haggard didn't dress like he was trying to look rich, and he traveled in a tour bus, not a jet; but when it came to his guitar he made sure he had something that really spoke to him. You can see this instrument has a maple fingerboard. What you can not see is the fingerboard's radius. This is an extremely old fashioned 7.5" fingerboard radius. The fingerboard here is more rounded than any electric guitar you've likely played, unless you have played very old school style Fender's. The fingerboard radius one prefers is a pretty personal deal, and you can bet Merle wanted just that. Will you like it? Only you can decide that sort of thing. Look, this is the kind of guitar that is generally kept behind a case. You will usually have to ask someone to let you have a look at it. When I did just that, I was asked to remove my belt, take off my jacket, and to leave the keys or whatever else in my pockets with the people at the counter. So if you go to have a look see at one of these, be ready for that. Nobody wants to see a work of art get a scratch on it. 1 - bridge pickup 2-bridge and neck in parallel 3-neck pickup 4-neck and bridge in series (fatter tone than Pos. 2 and more output than 1, 2, or 3. Now I didn't talk about the pickups in either of these guitars above. There are reasons for that, and one of them is the guitars are so vastly different from one another that the pickups have little to do with the differences in tonal character between them. The other reason is both guitars feature nice, upscale sets of Fender brand pickups. The pickups are great, and I think it would be pretty crazy to ever change them from either guitar, but neither set is a custom set. These pickups can be found in much less expensive guitars which are much easier to find. What do these guitars cost? These are the kinds of instruments that a body buys because they are dead set on owning them, and so, the prices are quite high. 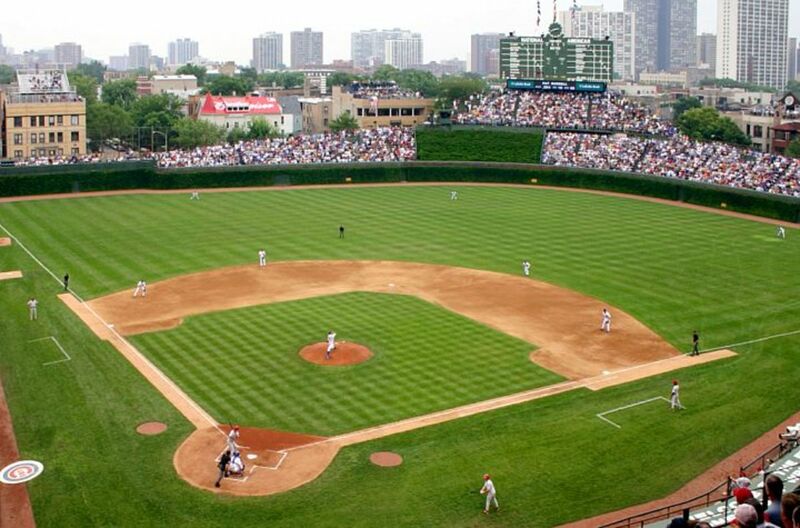 The ballpark on the Harrison is twenty five hundred dollars new. The Merle Haggard guitar goes for around three times that much. 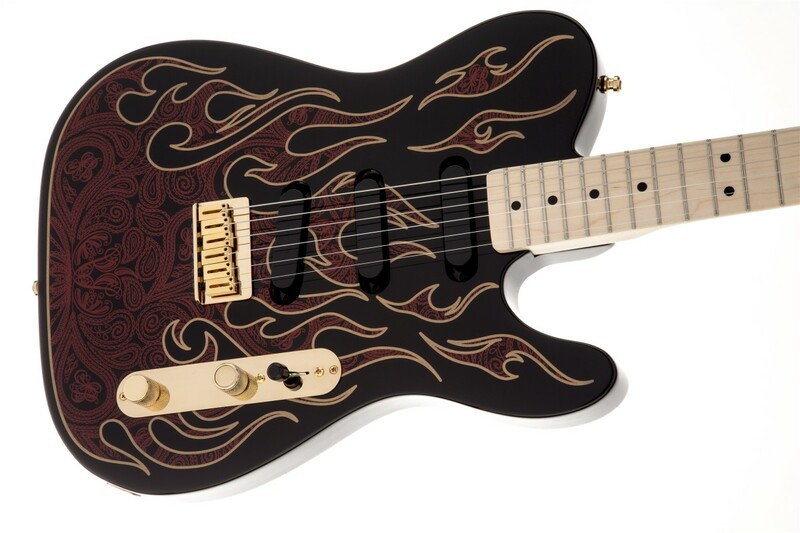 Yes, the Merle Haggard Tele is a seventy five hundred dollar guitar. With such a big difference in price one could wonder why they are being discussed on the same page. I understand that sort of thinking, but these are two of the most expensive Telecasters Fender has ever produced, and the two artists are comparable for their respective gigantic impacts on the culture of the USA, and western music. Harrison and Haggard are Iconic persons who've lived and died, and left mountains of great music for us to enjoy for a long time to come. You can sure make some music with these, and you'll impress the heck out of everyone for owning one. You'd probably be wise to consider insurance policies on either of these guitars. Thanks for reading. Hey thanks, Dave. I get intimidated when it comes to writing about persons like that - even in teeny tiny biography sections like this one. Hi Wes, I enjoyed your appreciation of George Harrison in this article. 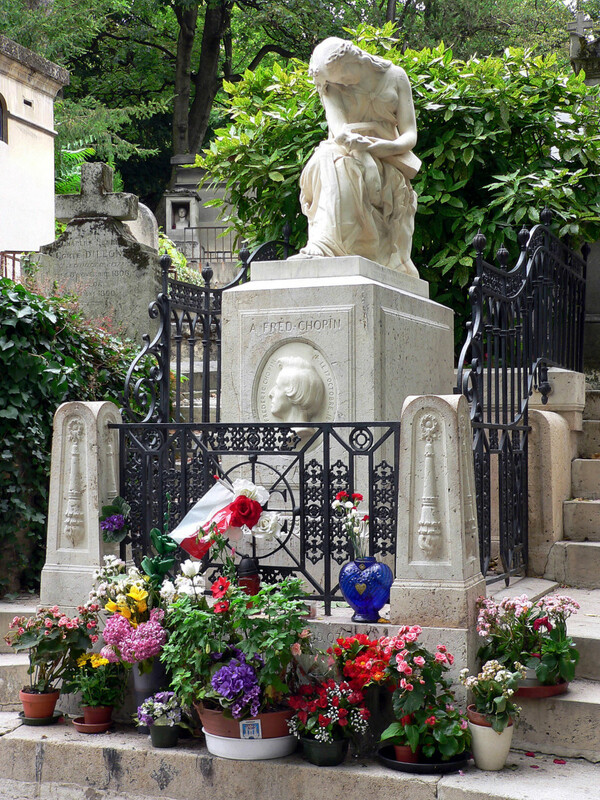 A great musician who, as you said, served the music before his own stardom.